5-7-5: Swimming drill or Haiku? Breath control is an important part of swimming. So we often do drills. A swim coach might write something like this on the board as a short drill set: 5 x 75 yards breathe 5-7-5. Translated as: for every 75 yards (that’s three lengths of the pool), one length breathe every 5 strokes, the next length every 7 strokes, the next every 5. Then do it again. Five times. Haiku is similarly restrictive. It is an ancient, nuanced art-form from Japan, but in the most basic terms, it is a poem consisting of three lines. A poetry coach might write something like this: 1 x 3 Lines syllables 5-7-5. Translated as: one set of 3 lines, the first line containing 5 syllables, the next 7, and the last 5. It is the only haiku I have ever written. A text exchange last night with Laura resulted in the composing of this haiku, which is appropriate, as 5-7-5 could be a breathing drill as easily as it is a restriction on syllables. It’s almost like a swimming/poetry conspiracy theory! This is the legendary Gertrude Ederle. 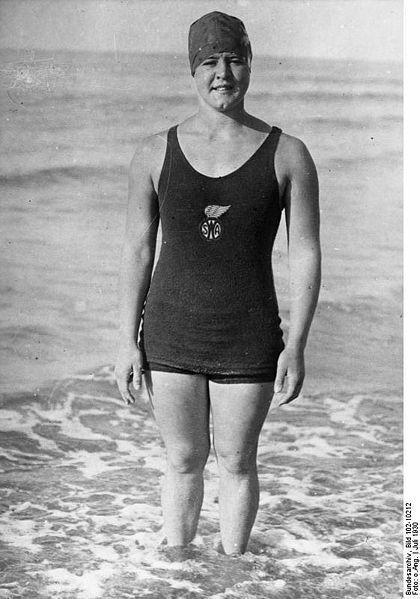 In 1926, at 19 years-old, she became the first woman to swim the English Channel. She beat the previous record (set by a man) by 2 hours. Her swim took 14 hours and 30 minutes, which was impressive on many levels, not the least of which was that bad weather forced her to swim the equivalent of 35 miles to cover the 21-mile distance. She held her record for 25 years. Go Gertrude! Now for better haiku, and since it’s open water, you should have a seasonal or weather reference in the last line! That’ll give you something to think about while putting in the mileage. I think my friend Karen Throsby is on this Malta week, if so, say hello & enjoy the swimming. That haiku was inspired by pool swimming. Now that I’ve done a 6 hour swim in 15 degrees I would write a different haiku, that’s for sure. Perhaps I will. No Karen on my trip. Want new posts in your email inbox?